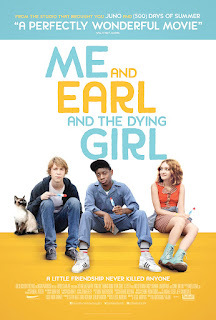 Me and Earl and the Dying Girl follows the friendship of an unlikely trio during their senior year of high school. The drama film focuses its attention on Greg, a socially inept teenager played by Thomas Mann (Hansel & Gretel: Witch Hunters, Project X), who enjoys making parodies of classic movies with his “co-worker” Earl. Much like Greg’s life, however, these movies have never made an impact on anyone. This is mainly due to Greg’s reluctance to share any part of himself with others, including his stash of movies, which only he and Earl are allowed to see. But when Greg meets Rachel, a girl diagnosed with leukemia, he embarks in what he calls a “doomed friendship” that will nonetheless change him forever. The cast alone was fantastic. I’ve been a fan of Thomas Mann for a while now, and he portrays the awkwardness of transitioning from adolescence to adulthood perfectly. Olivia Cooke plays the secondary main character, Rachel, and Connie Britton, Nick Offerman, Jon Bernthal, and Molly Shannon are the key supporting characters. Even the lesser known cast members, such as RJ Cyler, played their characters beautifully. The director, Alfonso Gomez-Rejon, is pretty new to the movie-scene, but he’s directed a number of TV episodes in series like American Horror Story and Glee. I expect that his career is just beginning to really kick off, and that we’ll see much more from him after his work with Me and Earl and the Dying Girl. The movie was more than enough of an incentive for me to go out and find the book it was based on, by the same name and written by Jesse Andrews. I went into the theater expecting a repeat of The Fault in Our Stars, but I was pleasantly surprised by a unique movie with snappy dialog and heartfelt emotions. It had just the right amount of weirdness, wit, and sincerity to work. The intended audience was definitely aimed at my own age group, with topics such as fitting in and choosing our paths in life, so I could completely relate to many of Greg’s insecurities. Even so, I think any age group could really enjoy this movie. Another thing I liked about the film was that it never romanticizes cancer. Instead, it focuses on themes like friendship, regret, growing up, and the impact we have on each others lives.